Over the next year, over 22,000 active-duty, veterans & spouses in San Diego will transition out of the military. Of those, over 5,200 will choose to start a small business based on data gathered from the Institute for Veterans and Military Families. VISION: The Rosie Network (TRN) and San Diego Financial Literacy Center (SDFLC) have partnered to provide ‘Service2CEO’. 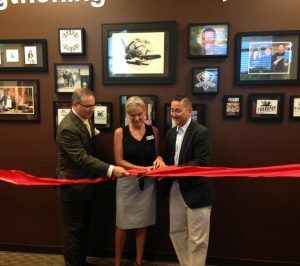 A first of its kind, entrepreneurial, shared office space and educational program offering the tools necessary to launch and grow small businesses and empower San Diego’s next generation of Military Small Business Leaders. 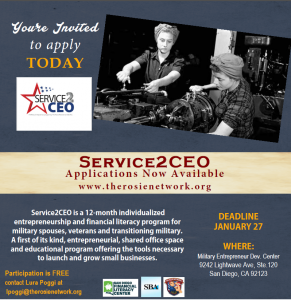 SERVICE2CEO: The Service2CEO is a 12-month individualized entrepreneurship and financial literacy program for military spouses, veterans and transitioning military. Participants will receive financial literacy counseling, concept feasibility assessment, business plan development, free website development and service-to-civilian mentorship from local community business leaders. Additionally, Service2CEO will provide business training including but not limited to: accounting, human resources, cybersecurity, sales, marketing, raising capital, record keeping, eCommerce, and management training. MILITARY ENTREPRENEUR DEVELOPMENT CENTER (MEDC): To meet the growing entrepreneurial desires of our military families and to increase job creation through small business development, The Rosie Network’s Military Entrepreneur Development Center provides free space, programs and services for the military community that supports the pursuit of entrepreneurial ambition and experiences that lead to skill acquisition, financial literacy, mentorship and networking. ROSIE’S LIST: To promote BUY MILITARY OWNED FIRST, Service2CEO participants will have the ability to build profile pages on Rosie’s List. This online, searchable database allows members to market their products and services to consumers worldwide. Rosie’s List and it’s marketing benefits are free and includes a personalized web page describing the business and the products and/or services offered. Each member page can include a shopping cart feature for direct sales. 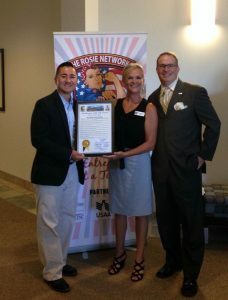 All businesses hosted on Rosie’s List are verified as Military Family Owned. THE NEED: Many veterans, 57%, rate their pay and benefits as top concern while 53% rate their transition as extremely difficult. Further, 46% took longer than expected to obtain employment with the top stressors on the family being financial management and employment. One of the top three obstacles to financial success for veteran families is lack of spousal employment opportunities even for those with portable skills. Service2CEO participant and Army Veteran, Scott Tucker, is having an event titled: Transition 2.0: Take the Next Step Toward Financial Wellness Seminar on July 19th @ 6pm to 8pm at iHeart Media Building, 9660 Granite Ridge Drive Ste 210, San Diego, CA 92123. Register at here. The 2017 Veteran and Military Entrepreneur Conference & Awards are on Wednesday, October 25th at the Hyatt Regency La Jolla at Aventine. Flyer here.